Organized retail crime (ORC) is not a new challenge to the retail environment, but it is a criminal element that continues to grow and evolve at a rapid pace. With thieves and the supporting criminal market urgently seeking new and creative ways to pilfer goods and maximize their profits, it becomes increasingly important for retailers to keep pace. A big part of this involves keeping current with both the means and the methods of the professional theft enterprise. In order to maximize profits, organized retail crime networks have long attempted to return stolen merchandise back to the retailer as a “no receipt” return. With many retailers previously providing cash back for returns under a designated dollar amount, this well-known criminal approach basically resulted in criminals selling back the stolen merchandise to the retailers for substantial profit. Most retailers have since changed their return policies, and typically issue a gift card or store credit for the amount of the merchandise, including sales tax, for returns made without a receipt. However, this still offers the thief a lucrative opportunity for gift card fraud; instead of fencing the merchandise for 30 percent of its value on the streets or selling it on the secondhand market for 60-70 percent of its value, they can sell the gift card for on average 80 percent of its market value. Factoring in the sales tax portion of the return—which can bring an additional 5-10 percent in most states—the thief can be looking at an 85-90 percent return on the retail value of the stolen merchandise. Online sales currently provide the best mechanism for thieves to sell these gift cards. With various e-commerce “buy it now” options that enable a quick turnover of a gift card, eBay has been a popular auction site for the sale of these cards. However, the cost of auction listings and Paypal fees eat into profits. Furthermore, with retail loss prevention teams now working closely with eBay investigators, the thief may also risk exposure to the criminal paper trail and the increased potential for detection and prosecution. As a result, Craigslist has become a preferred option for the sale of these gift cards—and potential gift card fraud. This free classifieds site is popular in the United States, with most transactions completed with an in-person meeting that is almost always cash-based and untraceable. The seller can quickly eliminate the paper trail by deleting the Craigslist ad once the gift card is sold. Below is an example of a $3100 department store credit being advertised on Craigslist for $2570. While the sale of gift cards at these highly discounted rates is not in itself proof of criminal intent, the brazen solicitation of high-valued store credits such as these only further underscores the need to raise awareness of the magnitude and severity with which the secondhand gift card marketplace has grown, and the need for retailers to monitor and investigate these listings on Craigslist and similar online classifieds sites for gift card fraud. In order to validate the potential impact of this secondary selling market, we’ve compiled some statistics to support these concerns. While definitive conclusions cannot be made on the origin of these cards and/or the intentions of the seller based simply on the available data, there are some clear trends that warrant our attention. 1. 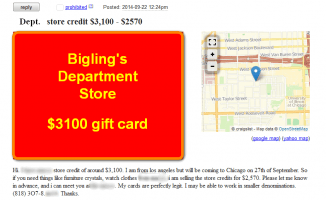 All Craigslist “For Sale” ads from Jan. 20 – Oct. 30, 2014 throughout the United States that contained the keywords “gift card,” “store credit,” or “prepaid debit card.” About 95,000 ads were pulled that matched this criteria. 2. Obvious duplicates (ads with the same title, location, and price) were eliminated and irrelevant content (offers to purchase gift cards, gift cards in combination with merchandise, bartering offers, gift-card-making machines) was cleaned up. About 65,500 ads remained after this cleanup effort, which is labeled Part I data. 3. The retailer name, asking price, gift card value, location and phone number were extracted from these ads. Gift cards that did not contain both a value and an asking price were eliminated. 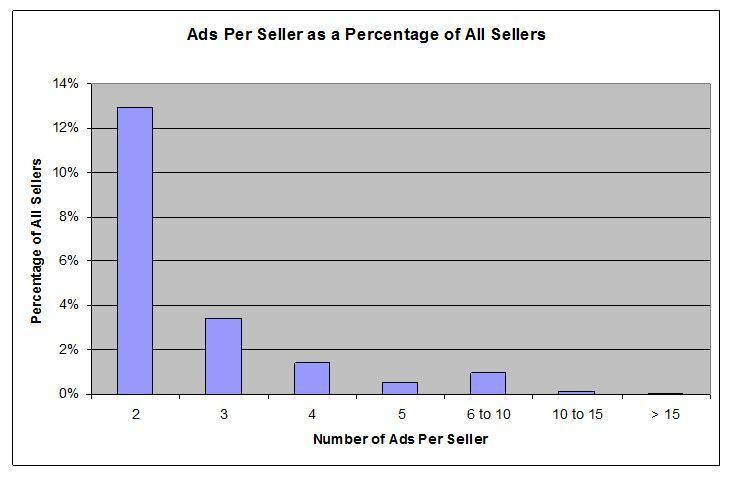 About 33,000 ads remained at this stage of the analysis, which is labeled Part II data. The chances of a store credit being legitimately obtained typically decrease the higher the value of the gift card. However, we must also consider the average purchase price of merchandise in some retailers is lower than the prices at brand-name boutique stores, so comparisons can’t be made unless the retailers are of the same industry or class. That is why gift card values need to be presented in a segmented manner. Overall, the secondhand gift card marketplace on Craigslist totaled about $7 million over the nine-month period and did not include a potential spike during the busy November and December shopping periods. Figure 1 indicates the total values of the gift cards advertised for the top 100 national retailers. 20,453 of the 59,578 ads where the store credit’s value was explicitly mentioned were for gift cards that are not considered national retailers, and were eliminated from this analysis. 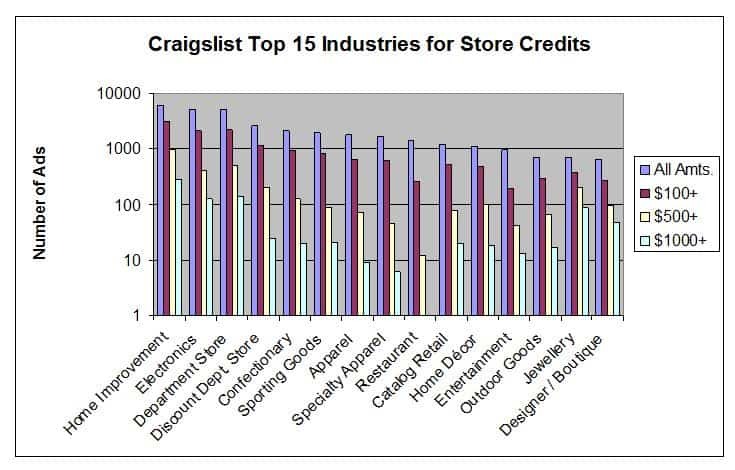 From the Part I data, Figure 2 indicates the top 15 industries appearing in the ads for gift cards and store credits. Ads were categorized by gift card value (1) all amounts, (2) values of $100 and up, (3) values of $500 and up, and finally (4) values of $1000 and up. 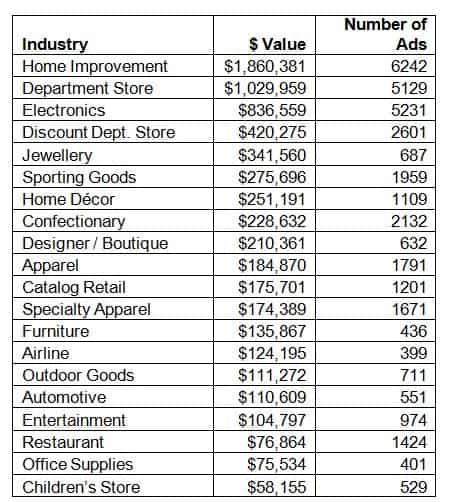 The retailers that were ranked high in all dollar classes were home improvement and electronics. Some retailers that contained high volume of gift cards below $100 had very few at high volumes, such as specialty apparel and restaurants. Some retailers that were low volume below $100 are high volume at $500 and above, such as jewelry and department stores. Figure 3 indicates the top metropolitan areas for gift card ads. 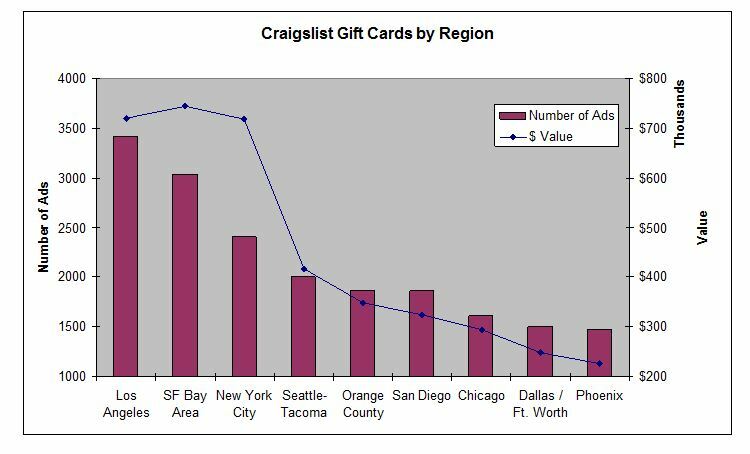 Generally speaking, the ranking of each metropolitan area on Craigslist correlates with population rankings, except for Seattle/Tacoma, which is ranked #21 in population, yet is ranked #4 on gift cards. Furthermore, the state-wise geographic breakdown generally correlates with population rankings. The largest anomalies of the top 10 states indicated are Oregon (rank #27 in population), Washington (rank #13 in population) and Arizona (rank #15 in population). The Part II data was used as the basis for Figure 5, which indicates the gift card price as a percentage of the value. Sometimes the ads contained bogus prices on the listing title, like $1, to help draw in the customer, but when you look at the details of the ad, their asking price is much higher. Any ad where the asking price in the title was less than 10 percent of the value or above 100 percent of the gift card was thrown out. The peak in the distribution is at 80 percent, with a longer downward tail towards 10 percent. It is unclear to the author whether a low price / value implies that the gift card was obtained via some type of fraud, or whether a legitimate seller is simply desperate to liquidate his/her gift card. If the gift card’s price is below 50 percent of its value, that corresponds to the lowest 3 percent of this distribution. If this is further combined with a high value of $500 or higher, it also could turn into a potential store robbery situation. Many holdups or robberies are triggered by a Craigslist ad where the seller is offering something too good to be true, and where the seller agrees to meet the buyer in a remote location . In many of these gift card ads, the seller offers to meet the buyer at the retailer in question to check the value, or to pay for the merchandise the buyer picks directly with the gift card. Repeat sellers of gift cards would also have a higher correlation to illegally obtained gift cards or gift card fraud. 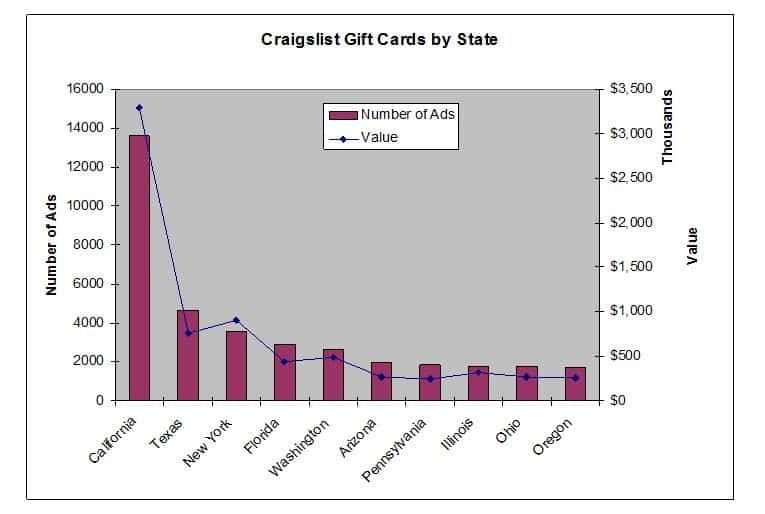 About 80 percent of the Craigslist ads are single ads for a single gift card, while the remaining 20 percent of Craigslist sellers have multiple ads for potentially multiple gift cards. Due to the potentially broad nature of the Craigslist postings, it is difficult to determine whether a seller is posting a duplicate ad, a second gift card is available, or a single ad with multiple gift cards. Therefore some margin of error is expected with this particular analysis. Among the sellers with fifteen or more multiple gift card offerings, only two of them were offering gift cards from one retailer exclusively, and one of them was offering gift cards from the same group of companies. The majority were offering from multiple retailers, which eliminates the likelihood of an internal theft issue. Based upon the findings of our study, it is clearly worthwhile for retailers and their loss prevention staff to monitor and review the second-hand gift card online market such as those found on Craigslist and similar sites in order to mitigate the opportunity for thieves to exploit the “return with no receipt” method of liquidation. 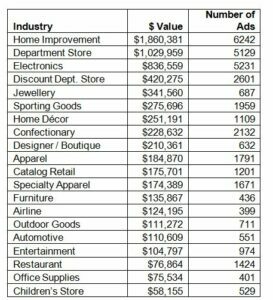 Big-box stores are particularly exposed with seven of the top ten retailers in gift card value sold on Craigslist today. However, a broad spectrum of retailers are represented as part of our statistical pool, whether based on the type of retailer, the size of the stores, the products sold, and other distinguishable characteristics. 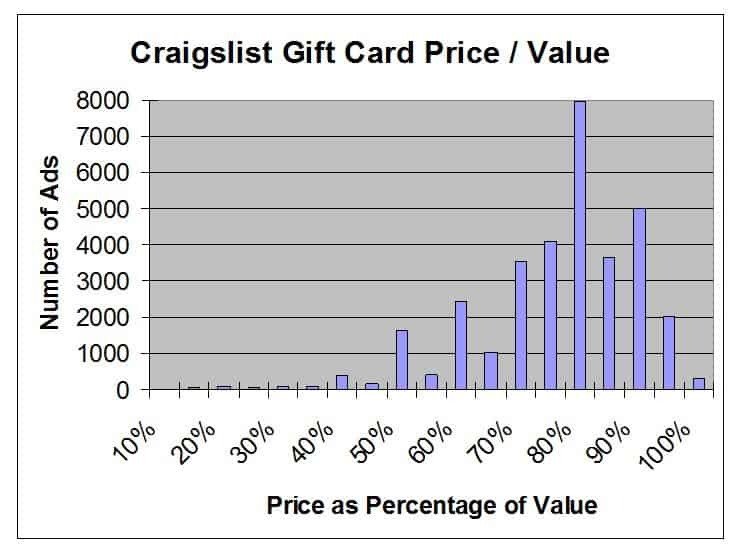 The average selling price of a gift card found on the Craigslist classified listings is typically 80 percent of its value. California is the biggest single sales state by value and by volume of ads, being three times higher than for Texas, which has the second-highest numbers. The use of gift cards has opened many opportunities for retailers to expand sales options, attract additional business, and serve the needs of their customers. However, this has also opened up doors to store card fraud. As retailers strive to explore new and better ways to serve the customer, it’s important that we always keep our eyes open to the potential opportunities, and use our available tools and technology to protect our goods, our customers, and our profitability. This article was originally published in 2014 and was updated December 8, 2016. 2. US city and state population data courtesy of Wikipedia.